nuclear power | The Captain Britain fans' page and blog. 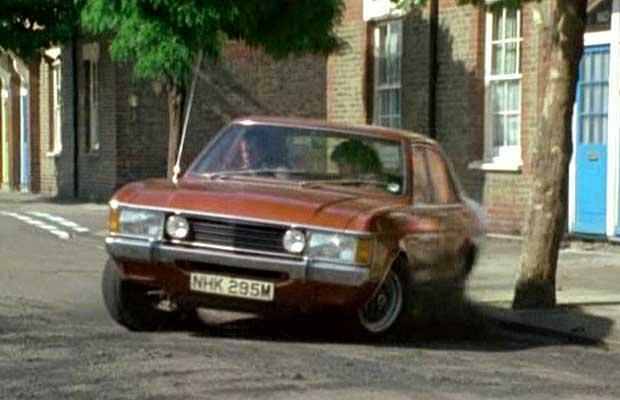 Captain Britain, The Sweeney and the Seventies. Despite Captain Britain being a fictional superhero and me being a forty year old blogger with too much time on his hands we both have something in common, in that we are both children of the seventies. Cap made his debut in 1977 whereas I made mine a few years earlier, and I was a lot younger. However I like to think we both “grew up” in the Seventies so to speak. So today I have decided to look back on my memories of the Seventies and see how much of an influence those years had on Captain Britain’s early stories. Read on to discover how Seventies cop shows, smoking and sci-fi films all – in my opinion – had a direct effect on the origin of Captain Britain. 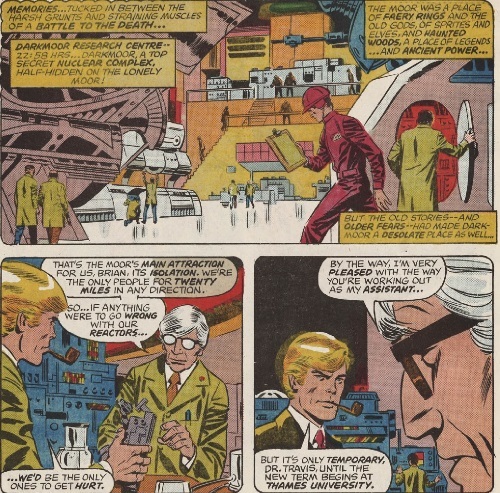 So let’s start by looking at the TV of the Seventies and a program that I think had a major influence on the design of Captain Britain’s world. 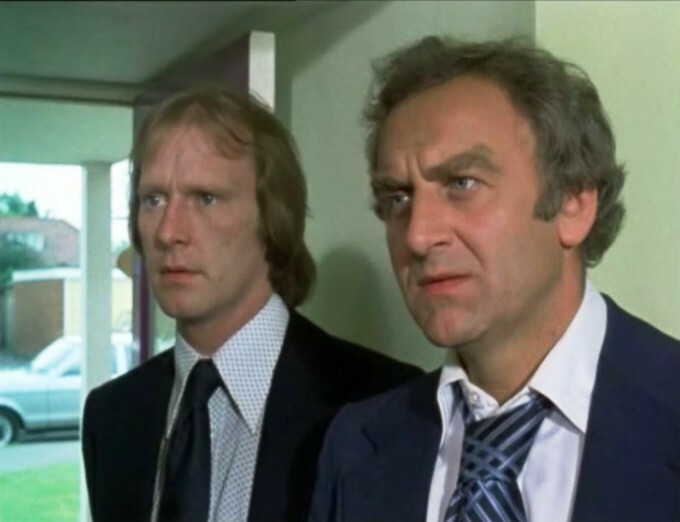 No it wasn’t Dr Who, though I did discuss its influence on Cap here, I mean cop shows and one I was probably too young to be watching, The Sweeney. 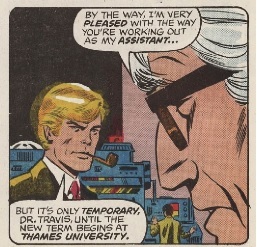 Almost immediately as you read Cap’s if you’re a citizen of the UK you can’t help notice how Captain Britain’s Chief Inspector Thomas channels The Sweeney’s detectives. 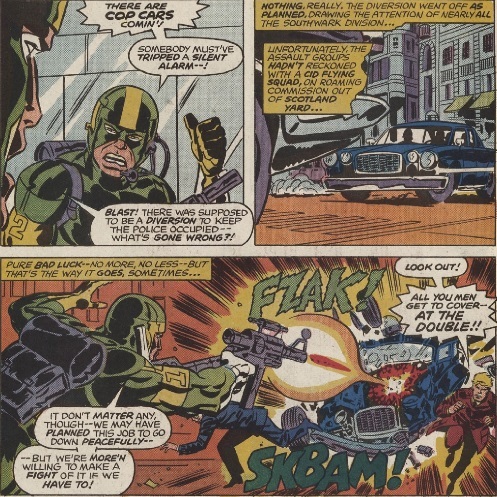 The reason I am sure is that maybe without the benefit of much reference material in the Seventies Captain Britain artist Herb Trimpe may well have turned to the TV for help, and the Sweeney was one of the most popular Seventies cop shows – well in my school anyway. 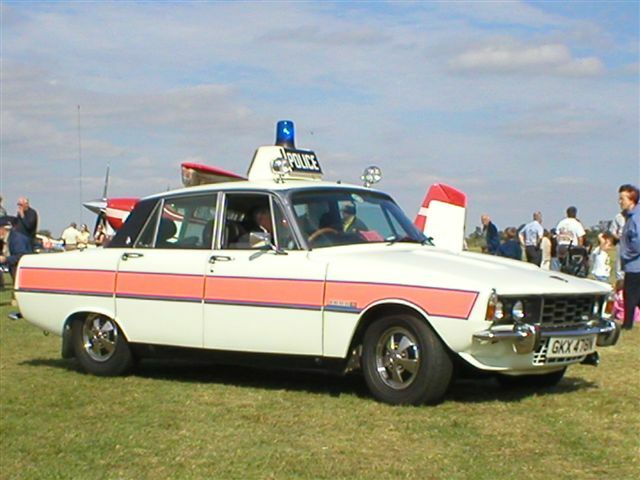 And here is a Cop car from the Sweeney. Coincidence? I think not, anyway time to move on. A common chant on Seventies TV news and in the papers was the phrase, “nuclear power no thanks.” The reason behind this was the world’s growing desire to see the end of nuclear weapons and power plants that many believed were time bombs of the worst kind. I want to focus in on nuclear power plants as that is where Captain Britain worked. Nuclear power in the Seventies was a growing source of what was believed at the time to be safe energy without reliance on fossil fuels, and I remember barely a week going without the news covering demonstrations against anything nuclear. So it’s no surprise that when Claremont tried to make Captain Britain rooted in current – Seventies – culture that he chose nuclear power. Interestingly this was also the first reference to the fact that Captain Britain was a genius, something that became an erratic personality trait as his character grew. Now another memory of the Seventies was triggered by the last panel of the above picture, let’s look at it in more detail. In the summer of 1977 Star Wars hit cinema screens and science fiction was never the same again, but there is one particular point in that film that to me is reflected in Captain Britain. 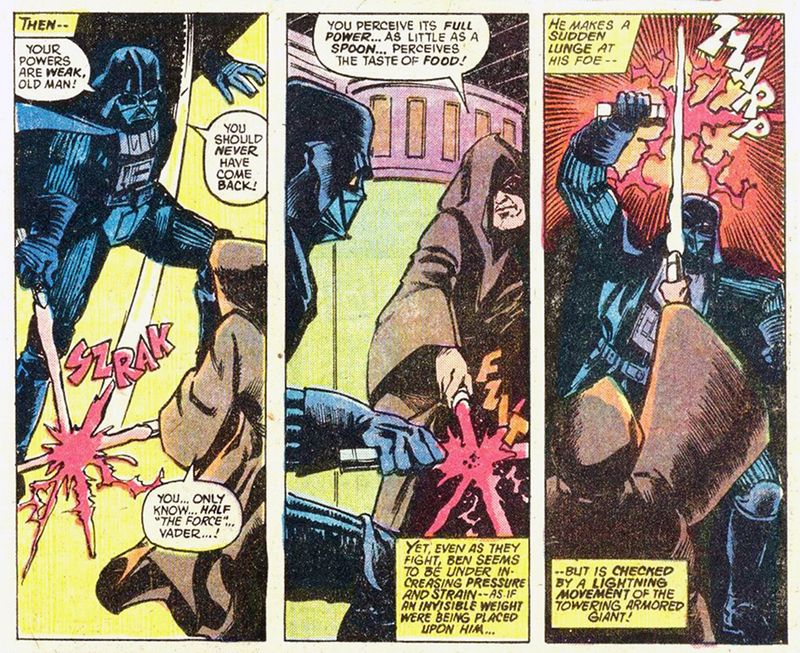 You see in the film when Kenobi and Vader duel I can’t help but think of this scene from Captain Britain. To me this whole fight wears its Star Wars influence firmly on its sleeve even down to the design of the baddie and that the staff and sword wielded by the combatants could just as easily be lightsabers. Have a look at the Marvel version of the famous Star Wars duel below, and marvel at both scenes incredible sound effects. 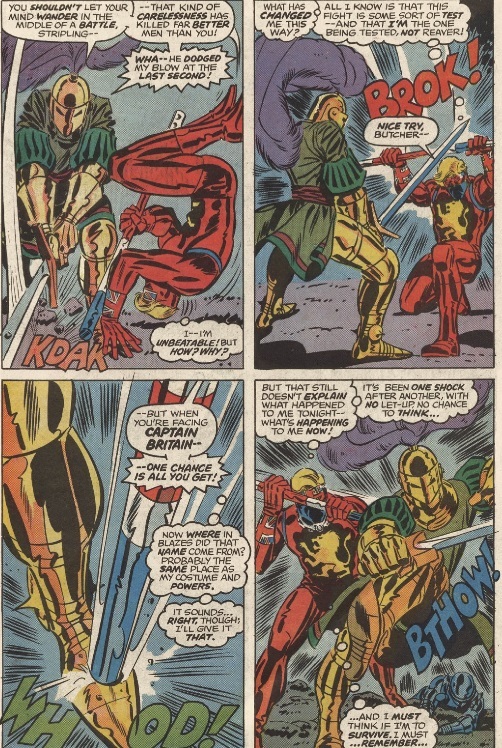 So there you have four – probable – Seventies influences on the early stories of Captain Britain. Influences I would like to point that are really only recognized by me casting my mind back nearly forty years to when I was very young. Agree or disagree please sound off in the comments section below. To keep up with all the posts you can follow The Captain Britain Blog on Facebook, or on Pinterest, or subscribe to this blog by entering your email in the link top right.